Is there an adjoining closet next to the half bath? If so, you could take out the closet to have space to add a shower. If there is no adjoining space to expand into, could you possibly move the bathroom to a different area, like a bigger pantry off the kitchen, and convert the existing half bath into a new pantry? Once you determine whether you can expand or need to relocate the half bath, the next step is to decide whether you will have room for a combination tub/shower, or just a shower. Most people opt for a shower stall simply because it takes up the least amount of space. There are a few options to choose from, such as installing a shower pan and adding the door, shower wall kits, and other features, or installing a prefab shower stall, which already has just about everything you need. To get started on the bathroom renovation, it may be necessary to gut the existing room, like if you are relocating the bathroom or needing to expand into the wall space behind the sink or toilet. Remember to shut off both hot and cold water lines to the bathroom before disconnecting the toilet and sink. In other cases you will be able to leave these fixtures alone, as long as there is sufficient room to work to remove the wall and install the shower. 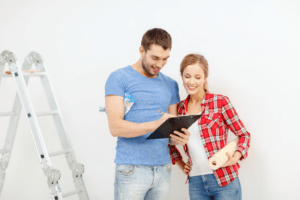 Unless you are skilled at plumbing and running new water and drain lines, you will want to hire a professional to do this part of the bathroom remodeling. Some plumbers will also install the shower pan or shower kit you ordered after running the new water and drain lines. If the half bath currently does not have a bathroom fan and needs to have the lighting upgraded, it is worthwhile to consult with a licensed electrician for assistance with these upgrades. An electrician can make sure the electrical demands for the bathroom will not overload existing wiring and circuit breakers. Not only can they run the new electrical wiring required, but also install additional breakers, if necessary. This is also a great time to consider installing new flooring and/or painting the walls to give the new bathroom a modern look and feel. Whether you decide to do most of the work yourself or hire a contractor do the entire project, it is important to remember to be careful when removing sections of the wall, as they could be could be support beams for the home, or there could be electrical wiring and plumbing behind the wall. To obtain shower kits, shower pans, and other accessories, or if you need to convert your half bath into a full bath, call American Bath Enterprises, Inc. at (888) 228-4925 now!